Most of us were first exposed to writing in school. With this new world of expression came a set of rules as unchangeable as death and taxes. But, as any professional writer has found, there is a huge gulf between academic writing and writing for the public. As a matter of fact, the previous sentence would offend most grammar/writing teachers because it begins with the word ‘but.’ The once solid foundation of grammar rules we learned in school are, with few exceptions, now optional. So where is a budding writing to turn for credible information on this minefield? Enter William Zinsser, who by the way, also served on the usage pane of The American Heritage Dictionary. 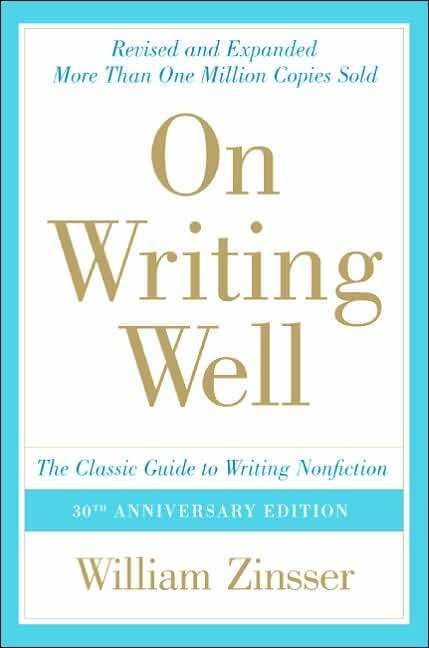 There are hundreds of writing books on library and book shelves, but On Writing Well is one that every serious writer should own. This 300 page book is a breath of fresh air and a bridge between dry grammar tomes and esoteric motivational writing books. He covers a wide range of subjects, including word usage, structure, style, tone and unity. He discusses many different mediums from travel articles to memoirs. This book is easy to read, as entertaining as it is instructive. Zinsser points out common writing mistakes and offers simple solutions. Every writer should read this book, at least once a year. It doesn’t matter if you’re a raw beginner or a seasoned professional, this book will improve your skills and make you a better writer. Did you know that you have a contract with your reader? You do. THE READER agrees to suspend belief and enter the fictional world that’s been created. THE WRITER agrees to do everything possible to facilitate their remaining, undisturbed, within that world. What exactly does this legal jargon mean? Let me explain. Have you ever been reading a book or a story and something startles you and you realize you actually felt like you were IN the story? It’s almost like an alternate reality or a dream. Use correct grammar. Glaring mistakes can jar THE READER awake, making them wonder why they agreed to read you story. Make your Point of View (POV) shifts clear and seamless. When you change POV make certain you have a good reason for doing so. Use unobtrusive attributions, like said. Even better, use a speaker beat. Vonda Skelton had an excellent explanation of this on her blog post last week. Avoid overuse of misspelled words to indicate dialect. A little is fine, but once THE READER has the character’s voice in their head, continuing makes the dialogue difficult to read. Avoid italics when possible. An occasional italicized word for emphasis is fine, but thought after thought in italics is hard on the eyes. Instead, try to write deeper from the character’s POV. This is sometimes called Deep POV. Following these simple guidelines can make it easier for THE READER to immerse themselves in our story. Have you ever saved someone’s life? Last week my son did just that. He driving down the interstate and watched the car ahead of him lose control and flip 5 times, coming to rest on its side. My son screeched to a halt and raced to the wrecked car where flames were already visible snaking out from under the hood. My son climbed onto the car and wrenched open the back door and dropped inside. The driver hadn’t been wearing his seatbelt and was slumped in the passenger seat, fading in and out of consciousness. My son somehow got him up and out of the car. As they got about 75 feet away from the car the gas tank exploded and the car was engulfed in flames. I learned about these events after they happened and found myself voicing the quintessential mom question, “What were you thinking?” As soon as the words passed my lips I had to explain. I wasn’t questioning the fact that he’d done it, I really wanted to know what thoughts went through your mind at such a horrific choice. I immediately thought how wonderful it would be to have such clarity—such a clear choice. Don’t we all wish that all the choices were that clear cut? But as I meditated on what my son had done, God began to speak to me. He showed me that every time I come in contact with someone who doesn’t know Jesus, I face the same choice as my son. I can offer them life, by sharing who Jesus is, or I can stand by and risk watching them die. Many times I don’t even consciously make the decision. I let my busyness or my daily schedule dictate my decision. I even allow myself the comfort of assuming that someone else will do the job. But where would that young man be if my son hadn’t acted and instead waited on someone else to rescue that driver? I challenge all of us to act when the opportunity presents itself. I know I’ll never approach another conversation the same way again. God is to us a God of deliverances and to God the Lord belong escapes from death. I have to tell you I love this book. Several reviews of this book suggested that it wasn’t as in depth as his other work, Writing the Breakout Novel. I have to respectfully disagree. From the introduction, where he discusses the difference between status seekers and story tellers, through the chapters I found enough material to study for a year or more. This book manages to be a primer for anyone wanting to write great fiction, as well as a must have for any established writer who wants to improve his craft. Each chapter provides examples from contemporary fiction and a great section called Practical Tools. These tools are exercises that I used to cement the lessons taught in that chapter. It’s one thing to find a great writing book to read—it’s something else entirely to find one that provides so much practical application. I also had the opportunity to attend a one day workshop by Mr. Maass at the 2009 ACFW Writers Conference in Denver, CO. I have to tell you it was amazing! If you ever have the opportunity to hear him speak, don’t pass it up. But, that said, all of what he spoke on was covered in The Fire in Fiction. His writing style closely follows his speaking style and I believe that’s one of the reasons this book stands out among craft books. So run, don’t walk, to your local bookstore and pick up The Fire in Fiction. Have you ever noticed how there aren’t enough hours in the day? I certainly have, in fact, that’s probably been one of the biggest complaints in my life. It frustrates me, I have such good intentions, but there seems to be no way to carry them out. I began to pray about this problem and as I did, slowly, God helped me see the answers. I definitely haven’t arrived as far as solving this problem, but I finally feel like I’m on the right track. Essentially, God showed me that I’m not capable of ordering my day effectively without His guidance. He, not me, is the one who has the foreknowledge to prepare for upcoming things in my life. He reminded me that He is never surprised by events, circumstances or people. When I put Him first and make my relationship with Him my priority then everything else falls into place. There is no earthly explanation for this miracle, but I can attest to it in every aspect of my life. Challenge: Take a week and every day, especially when you don’t have time, read a verse of two of Scripture and pray. Watch what God does with your time – I dare you! Last Saturday I had the privilege of spending the day at another writer’s seminar. This one was the Writers Express, put on by CLASSeminars. This one day event covered many topics, touching on all aspects of writing. It covered everything from fiction techniques to article writing for print or Internet. The main instructors were Linda Gilden and Tama Westman. Also presenting were Vonda Skelton, Craig Von Buseck, And Edna Ellison. CLASS puts on a top notch seminar, with great instructors. This particular seminar is offered in different locations throughout the country. I also recommend their Christian Writers Conference in November at Ghost Ranch in New Mexico. One of the things I like best about these smaller, one or two day seminars is the size. The more intimate setting encourages questions that many beginners are afraid to ask in a larger setting. It also allows more interaction between the faculty and students. When I’m planning my year, I like to budget my conference expenses between a mix of smaller and larger conferences and seminars. A lot of people ask me how to find a good conference to attend. I’ve found the best way is from referrals and recommendations. Let me know what good writing seminars or conferences you’ve attended. Do I Need a Facebook Page? And What is Twitter? You can look at this digital age we live in as a blessing or a curse—and there are merits to each viewpoint. I happen to take the positive approach. I like the connectedness of this time and place. But, to answer your question. Yes, you need to have a Facebook page. It’s a place to connect with those who have the same interests as you, ie YOUR READERS! And Twitter is just a connection made with fewer characters. A word of warning here, it’s possible to let these two tools eat into your writing time. For myself, the way I combat that temptation is to schedule my networking time. Many of you have asked how I schedule my day so now is as good a time as any to share it with you. Now, please know that I am NOT an organized person, but this loose arrangement of my day helps me to stay sane in the insane world of freelance writing. 8-9 I answer email (I have two accounts). I check my blog for comments and I check my Facebook and twitter pages. I use this hour to get connected. Now, some days the times vary, especially if I have a big deadline, but this is my basic schedule. I try not to be subject to emails or even the telephone. Funny thing, I discovered that people are fine with leaving messages and I actually can call them back! This allows me to accomplish what I need to everyday and still stay sane. Have you found a schedule or way of doing things that helps you cope? Share it with us – I can always use the help! Paul didn’t have this problem. These verses are the start of his second missionary journey. He left on that journey with the decision to go to Asia. Reading theses verses show that God had something else entirely in mind. But nowhere in these verses do we find condemnation of Paul for having acted, even though he obviously missed what God had intended. What an inspiration, what comfort! I can act on what I think God is saying without worrying about Him abandoning me. The key to this is my heart—if I’m truly seeking what’s important to God, He’ll never leave me to my own devises, but always guide me back to His path. I'm proud to turn this week's review over to Mary Denman. She's a fellow writer and dear friend and always knows the best writing books! Thanks, Mary. How useful could a writing book published in 1913 be? Especially one that’s only 85 pages long and could fit in your back pocket or purse. In the case of The Elements of Style, the answer is incredibly useful. William Strunk originally wrote and published the book for English classes he taught. He proudly called it “the little book.” Why? Because he had distilled the rules of the English language down to a manageable size. Millions of copies later, we can still learn from the master. He first covers elementary rules of usage—which we all need to review. Remember gerunds? Maybe not, but you still use them. Strunk shows you how to use them properly. Then come the principles of composition. He teaches about active vs. passive voice, when negatives are stronger than positives, and how to make your words stronger. Included is a section on misused words and expressions. This section alone will keep you from making mistakes that catch an editor’s eye. Need to learn about developing your own style? An approach to style is the section for you. Still not sold on the value? The book is loaded with concise examples that demonstrate what he means. You could pay hundreds of dollars for a professional to edit your manuscript. Why not buy this book first? It’s an interesting read and the benefits to your writing will immediate and tangible. The difference between good writing and great writing is in the details. While this book doesn’t cover plotting a novel, it will help you polish your manuscript or article, eliminating both subtle and glaring mistakes. And that makes this book a gold mine, where you can expect to glean nuggets of style from the first time you pick up this little book. Over the next few weeks I’m going to address some questions that come up everywhere I teach. One of the top ten is always, “I want to be a writer, do I have to have a blog?” The answer is an emphatic no. Nobody has to have a blog or a website to be a successful writer. As a matter of fact, in a lot of instances, it’s better not to have one. Several years ago, when there were fewer blogs on the internet, it was a good way to get your name out and build recognition. Now, everybody and their dog (literally) has a blog. Because of that, it’s harder to get your blog noticed. Let me emphasize, harder—not impossible. If you want to have a blog, it’s important to know what you want to accomplish. With so much competition out there, you also have to be quite focused in the content of your blog. You have to have a reason to post and make certain that is communicated to those who click on your site. Have a definite focus. My blog is all about writing—even more specifically it’s a blog devoted to teaching others about the writing industry. I can’t emphasize enough the need to focus, focus, focus! Try to find a niche that hasn’t been overdone. It seems that with the success of the blog, Novel Journey, everyone is starting a blog about their writing journey. Don’t copy what others are doing, try something fresh. Decide on a schedule to post and STICK WITH IT! If you announce that you’ll post every Monday, your followers will expect you to do just that. If they click on your site and one Monday nothing new has been posted they may not come back. If it happens more than once, I can guarantee they won’t try again. Pick a schedule you can meet. I started this blog by posting once a week. Now, I post three times a week. But I needed to start slow to make certain I could meet my deadlines. Now, if I haven’t scared you off, here are some places to go to build your blog. Two of the best are Blogger and Wordpress. Both are free, reputable and VERY simple to do yourself. This blog is built on a blogger template. And yes, there are other blogs out there that look similar, but people visit your blog because of the content, not how it looks. One note: If your blog is hard to read because of color choice, font or font size; it will KEEP visitors from returning to it. But the appearance of your blog rarely drives traffic TO your site. Both Blogger and Wordpress have a selection of templates that are easy to use. They both also have options to personalize your blog. Blogs, as opposed to websites, are easy to build and manage yourself. Later we’ll discuss websites. If you have any questions you’d like answered just post them in the comments section and I’ll get to them over the next few weeks. This book was one of the first I bought when I got serious about my writing, and when I wore it out, I bought the second edition. It was a hard craft book to read because I was still at the honeymoon stage of my writing career. What do I mean by honeymoon? I was madly and passionately with everything I wrote—in my eyes, I was brilliant. The only thing keeping me from publication was the fact that no one had read my work yet. In some ways, the honeymoon stage of any writer’s career is magical. But for the dream of becoming a published writer to turn to reality I had to learn and grow. Self-Editing for Fiction Writers is a book that facilitates that growth. It covers the basics, showing vs. telling, POV, characterization, they’re all there. My copy is dog-eared and highlighted. I make it a habit to read it through at least once every two years. At the end of each chapter are exercises so you can practice what you’ve earned. In addition, all chapters except the last, contains a checklist to use on your own manuscript. I use them every time I write something. At times, it seems tedious, but the polished prose that comes from the effort makes it worthwhile. I know this book was written specifically for fiction writers, but I use a lot of these techniques every time I write an article. Good writing works, no matter the situation. And good writers work at being better. This book will make you better.